Consist of either two winch launches, or a single winch launch leading to a soaring flight of between 15 and 20 minutes. Time in the air is very dependent on the time of year and the weather conditions at the time of the flight. 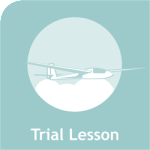 A full three calendar months’ temporary club membership is included in the price of the Trial Lesson, so you may return at a later date if you wish, and fly at club rates. However, if you are seriously thinking about taking up gliding or want more than a brief “taster”, then a Day Course is recommended. Trial Lessons must be booked in advance. Upon booking you will be advised of the time you should arrive at the airfield, BUT this will not necessarily be the time you will fly. The club is often busy and Trial Lessons may be slotted in with other flights; therefore you should be prepared to be at the club for at least two or three hours. If there is likely to be any further delay you will be kept informed of the situation. 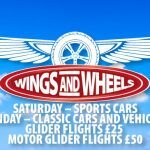 At only £84.00 you get Gliding Lessons, 3 months membership, between 1-2 winch launches and flying time lasting approx 20 minutes. Hi there Parvez, we receive notice of your address via the Paypal system, however our secretary will now contact you directly to confirm the details and arrange a mutually convenient date and time for your gliding experience. Best regards and many thanks for your booking, Den. After watching an episode of ‘All Over The Workplace’ my 8 yo son has shown an interest in flying. Is there any kind of ‘experience’ that would be suitable as a birthday gift for his 9th birthday in April? H Vickie, yes we often fly juniors who are interested to learn about aviation, but it depends a little on your son’s height and weight, so it’s probably best if you call the Club Office on Friday, Saturday or Sunday to discuss in more detail. Our number is 01206 242596. Hi there. Yes we can confirm that your step father will have a significant opportunity to operate the controls and fly the glider himself during the Trial Lesson instructional flights. How old do you have yo be able to get a trial lesson in a glider,I would like to give as a birthday present for my grandson next month. He will be 15 years old and ultimately wants to train as a commercial pilot one day,this would give him an insite into flying, he is currently a member of the Local air cadet group. With the latest EU laws in place we are now able to send junior pilots solo at 14! So your grandson would be very welcome to attend a Trial Lesson with us at ESGC and it would certainly be a beneficial contribution towards his commercial licence. We also have a very popular Junior scheme available at the club. Please don’t hesitate to contact us if you require any further help. Hello, I came down last weekend for a GE and had a great 10 min glide. The guys there said if I ‘topped it up’ by paying an extra 30 I could get the 3 month trial membership. If I can I would like to take you up on this. If I did this, how much, and how do I go about future flights during the three months? Can you tell me if you are sent a voucher for the trial gliding lesson as I would like to buy one as a gift for my husband? I just have to thank you for such a wonderful flying experience I had on Sunday 22nd June. It was my first time to commemorate a “big birthday” and obviously, a bit apprehensive but once safety features were explained to me and watching others take flight, I couldn’t wait for my turn ! I spoke to a pilot who told me it can be addictive and now I understand what he meant as I cannot wait to fly again. Everyone who meets the fitness standards should try this and I am so glad I did. Thanks to my pilot Andrew and all who helped to make my day special. I am thinking about buying the 75.00 lesson, can you choose the date or are there selected dates you must comply with ?